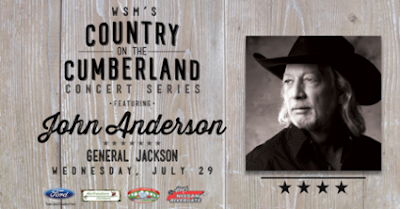 (Nashville, Tenn. – July 17, 2015) – Country music icon and Hall Of Fame songwriter, John Anderson, will perform an intimate acoustic show in Nashville on July 29 as he appears as the first guest on the inaugural Country On The Cumberland concert series, presented by 650 AM WSM. The special acoustic show, which will take place aboard the General Jackson Showboat, is a rare opportunity for fans to experience Anderson’s intimate show and marks the Country music legend’s first Nashville-based acoustic concert performance in over 30 years. As part of 650 AM WSM’s 90th celebration, the station is hosting the unique concert series aboard the General Jackson Showboat from July – October and will feature a spotlight artist for each concert. Listeners can purchase tickets to the Inaugural Country On The Cumberland concert via WSMonline.com, which includes an evening cruise down the Cumberland aboard the General Jackson Showboat, dinner, and a very special acoustic concert from the legendary John Anderson. Anderson will perform songs from his hit catalog and most recent album release, Goldmine, which was released on May 26. The highly anticipated new project features songs of faith, family, loss, the love of life and more, and is his first studio album release in nine years. Raised in Apopka, Fla., John Anderson grew up listening to both rock and traditional country. In the end, Anderson resisted the call of rock ‘n roll and chose to pursue his country music dreams, and is recognized as one of the greatest country singers to ever step up to the microphone and possesses one of the most instantly identifiable vocal instruments in the history of the genre. In 1977, Anderson signed with Warner Brothers Records and had his first major hit in 1980 with Billy Joe Shaver’s, “I’m Just an Old Chunk of Coal (But I’m Gonna Be a Diamond Someday).” Other hits include the classic “Wild and Blue” released in 1982, and “Swingin,” the No. 1 Billboard Country single co-written with Lionel Delmore that would lead Anderson to garner the CMA Horizon Award. Throughout his career, Anderson has produced 31 albums and released more than 60 singles (26 of which charted in the Top 10). He was inducted into the Nashville Songwriters Hall of Fame on October 5, 2014, and holds a wealth of industry awards including Academy of Country Music Career Achievement Award. Anderson is currently touring heavily throughout the United States. For a complete list of upcoming tour dates, please visit JohnAnderson.com/tour.